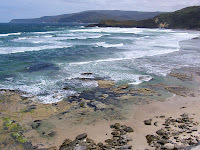 Had a good walk on the 17th January to South Cape Bay. Warm sunny day, and even the breeze on the beach wasn't too cold. There were quite a few walkers on the track, although many seem to just go to the cliffs or down to the eastern end of the beach, without walking along even to Lion Rock. 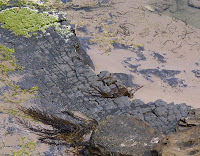 The rocks at the eastern end have been uncovered again, and the "tesselated" section is quite clear. 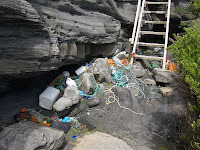 Quite a lot of rubbish from the beach has been collected over time and deposited between the two sets of steps down the cliffs. Most of this is obviously from fishing boats, and there is quite a collection now. I suppose it would be good to cart it out one day and remove this quite unsightly mess.